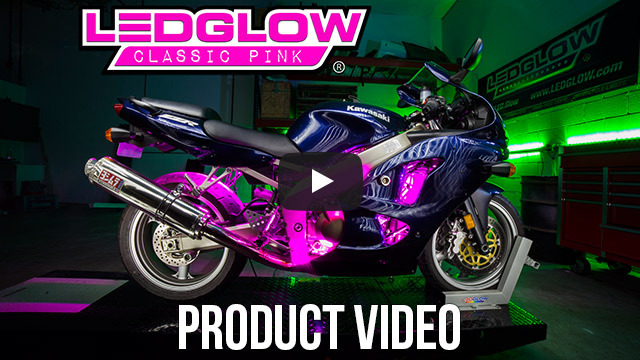 LEDGlow's Pink Classic LED Motorcycle Light Kit features multi-length flexible LED Strips that can create a customizable lighting option on your motorcycle. Each Kit comes with a wireless remote and one year limited warranty. LEDGlow's Pink LED Flexible Motorcycle Engine Lights Kit is a flexible LED light strip kit designed to illuminate your bike while featuring an assortment of outstanding abilities including wireless operation and unique pattern modes. 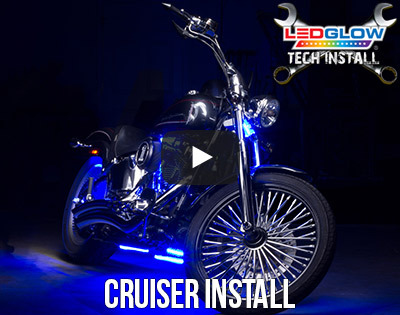 Select your desired kit size which is currently offered in 6 through 20 strip options with each strip including high intensity, wide angle LEDs designed for providing added style and safety to your motorcycle. The wireless remote allows you to effortlessly control the various lighting abilities including four brightness levels as well as strobing and fading modes. 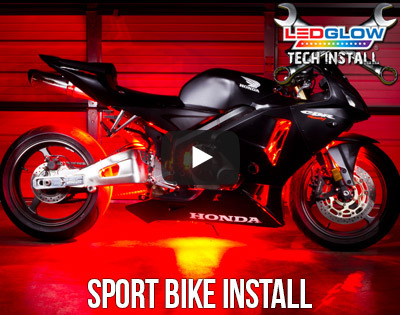 Each flexible light strip is easily mounted onto your bike with the included 3M tape and zip ties and allows you to bend or curve each 1/4" in depth strip to your desired position. Each strip is waterproof and features 5' of wire allowing maximum mounting capabilities. A one year warranty and free technical support are included with every LED motorcycle lights kit purchased. LEDGlow's Wire Extensions easily connect to the power wires on your flexible LED lighting strips to extend the 5' power wires to additional 1', 2', 3' or 5' lengths. This is perfect for larger bikes or lighting strips that are being mounted in locations further away from your control box. I purchase these light for my bike. I have a 1600 roadstar that is purple, and been the girl that i am i wanted pink lights. i installed this my self took me about 2 hrs.it was a piece of cake, the hard part was figuring were i wanted them. i love my bike. if i can put these lights on you can too. Installed the 12 piece set on my wifes bike in around two hours. The only reason it took so long was taping the wires under the tank. The 3M tape holds the lights very well and the length of wire is more than enough to run anywhere on the bike. The only wires that came close to being too short was from the right side on the back of the front fender to under the seat. Very bright lights really light up the bike at night. The various functions are eye catching and get comments everywhere we go. Highly reccomend the products for anyone.